TV footage shows lawmaker from Hindu nationalist Shiv Sena party shoving bread into Muslim supervisor’s mouth. The footage showed MP Rajan Baburao Vichare attempting several times to push the bread into the supervisor’s mouth as a crowd gathered. Vichare said he was not trying to break the supervisor’s religious fast. Instead he was trying to demonstrate that the chapatis or piece of bread, being served were too hard. The catering company’s general manager said the supervisor had been “deeply pained and hurt” over the incident as “religious sentiments are attached”. “They also issued physical threats to the kitchen and service staff while using highly objectionable language,” the manager said in an email to a Maharashtra government official, which was obtained by theIndian Express newspaper. Opposition Congress party legislators launched raucous protests in parliament, saying the MP had violated the man’s religious beliefs by aggressively trying to shove a chapati in his mouth. “It is absolutely reprehensible and should be condemned in the strongest possible manner,” Congress party spokesman, Manish Tewari, later told reporters. A top official of western Maharashtra state, Chief Secretary J Saharia, has said, “There are allegations like this. We are examining the whole issue and appropriate action will be taken”, according to The Indian Express. 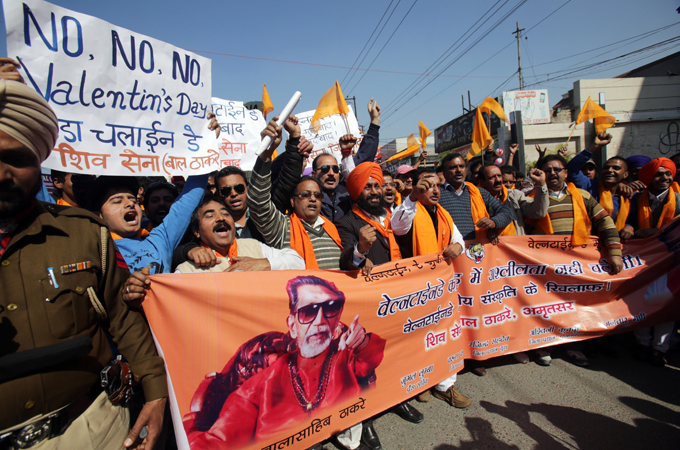 Shiv Sena, a key ally of Prime Minister Narendra Modi’s party which swept to power in May elections, has a reputation of blocking Valentine parties besides promoting ethnic and religious chauvinism while targeting minorities, particularly Christians and Muslims in India. The incident is likely to fan concern among Muslims and other religious minorities over Modi’s Hindu nationalist Bharatiya Janata Party (BJP) government.